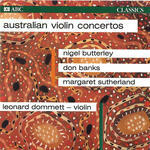 Violin concerto / Nigel Butterley. Violin concerto / Raymond Hanson. Violin concerto / Nigel Butterley. Instrumentation: Solo violin, piccolo, flute, 2 oboes, clarinet, bass clarinet, 2 bassoons, 4 horns, 2 trumpets, 3 trombones, percussion (1 player), harp, strings (2.2.2.2.2).